The Beam. Courtesy the de Young Museum and Rebecca Bradley. 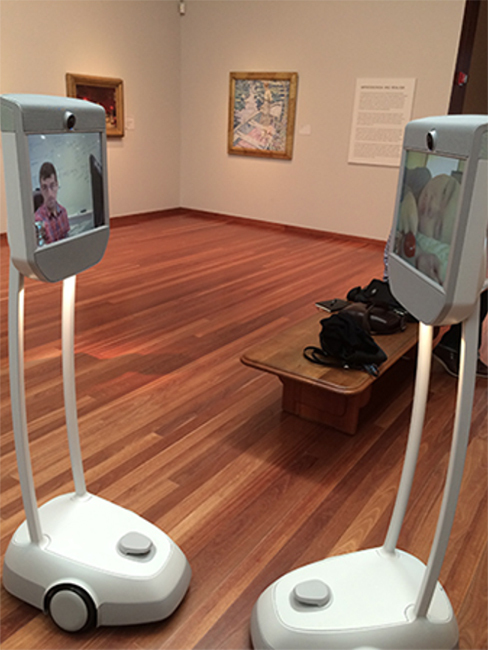 On a recent Monday this spring, a homebound five-year-old visited the permanent collection of the de Young museum in San Francisco using the museum’s Beam. The Beam is a telepresence robot with a computer monitor-sized screen, a camera atop a set of curved legs, and a simple wheeled base that create an anthropomorphic effect — particularly because the screen displays the face of the user about five feet from the ground. On this occasion, the Beam and its user roamed the gallery spaces while the museum was closed to the public; in the future, Karen Berniker of the de Young’s Access Program hopes to combine Beam tours with regular Access days (when the museum offers tours of special exhibitions with extra accommodations for visitors with disabilities). Kavita Krishnaswamy, a doctoral researcher in computer science with a rare neuromuscular disorder, has movement in only one finger and cannot leave her home. Using the Beam, she has traveled to academic conferences and defended her research, interacted with researchers at Microsoft and the Mobile World Congress in Barcelona — and visited museums like the de Young, the San Diego Air & Space Museum, and the National Music Museum. 1 The device “brings a new life of profound freedom,” Krishnaswamy wrote in an email. 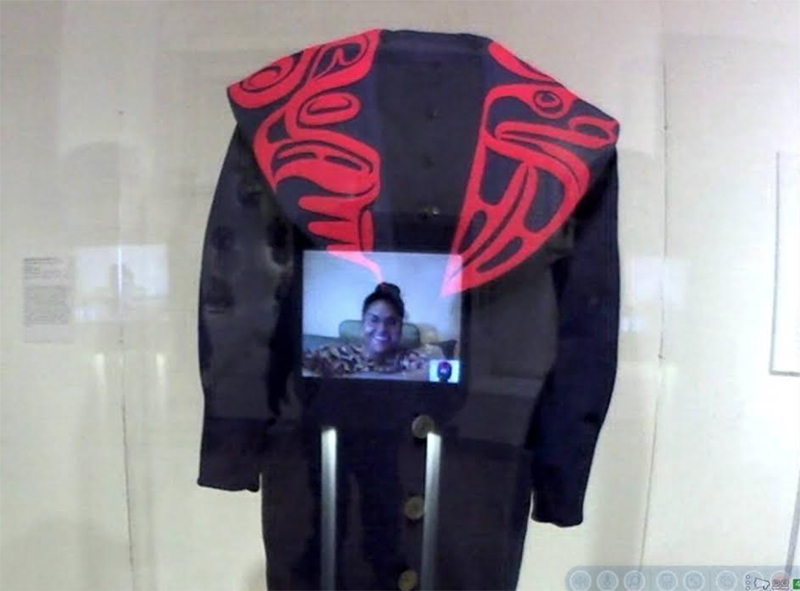 Kavita Krishnaswamy’s selfie at the Seattle Art Museum. Courtesy Kavita Krishnaswamy. The technologies comprising the Beam are not new: remote-controlled robots date back to the mid-twentieth century, and the two-way camera and screen for telepresent communication were firmly established almost twenty years ago. But adding a video chat function to an anthropomorphic robot and enabling it to be operated remotely is radical in its application, making visible and giving control to people who would otherwise be absent. Facilitating situations in which people with disabilities act and interact autonomously in public cultural spaces has political ramifications that begin to answer Johanna Hedva’s concerns. In “Sick Woman Theory,” Hedva describes the invisible protester who cannot leave her bed; she begins with the problem of political presence in reflecting on her inability to physically attend protests. The inability to be present in museums is a different kind of political erasure; by not having access to information about their cultural heritage, and — crucially — how it is framed, citizens are obstructed from intervening in dominant narratives. 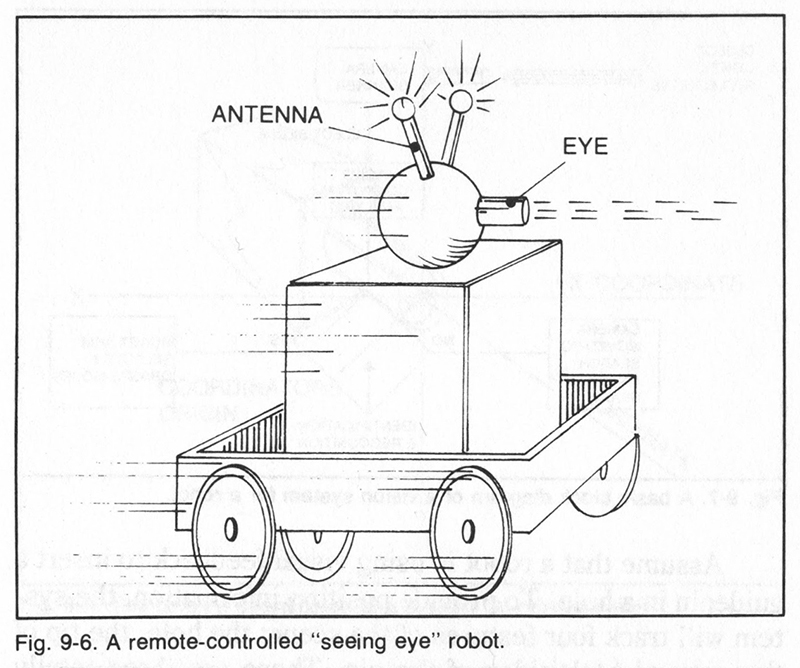 “Seeing eye” robot diagram from The Handbook of Advanced Robotics,Edward L. Safford, 1978. Courtesy the Prelinger Library. Many “universal” technologies were originally created for specific people with disabilities by those who loved them. Alexander Graham Bell, who was married to a woman who was deaf and taught at schools for the deaf, designed the telephone as a kind of hearing aid. The modern typewriter was created by Pellegrino Turri in the early nineteenth century for his friend (or lover, depending on whose account you read), a countess who was blind and unable to write. These stories, especially numerous in the history of communication technologies, run counter to the narratives of singular “geniuses” like Steve Jobs, who invent devices for a homogenous swath of consumers. Innovations like the typewriter are, rather than what we now call universal design, examples of inclusive design; when we encounter objects through the lens of inclusive design, we see a very different history of technology. August de los Reyes, a pioneer in formalizing inclusive design as a process, has described the creation of solutions for singular people as “love stories.” Inclusive design as a practice involves first examining overlooked individuals or communities and creating for them: solving for specific people rather than abstract problems. This results in better products for everyone, and a more streamlined process that often obviates the need to add accessibility layers later. The Beam was invented in 2012 by an engineer at Suitable Technologies, an able-bodied person who, frustrated by the limitations posed by remotely joining an in-person meeting at the office, simply added an iPad to another robot Suitable was developing. It wasn’t originally intended for those with disabilities at all — except this engineer wasn’t able-bodied if we understand disability not only as a socially-created condition, but as a fluid, context-dependent design problem. The engineer who couldn’t be physically present at a meeting was experiencing, temporarily, something akin to the condition of the homebound five-year-old who used the Beam to navigate a museum a few years later. …being “disabled” is not a fixed and assigned identity. It is not about a body status or a capacity level, but much more about this very complex, changing, evolving, and perhaps temporary, perhaps longer term, political state — in some ways, similar to how we’ve come to understand the slippery designations of race and gender. The built environment and socio-political institutions all make allowances and disallowances for certain kinds of bodies and capacities, and those affordances have ripple effects in cultures, creating abled-ness and disabled-ness. And disability is a status that is always in flux: you enter into different seasons in your life where you are more or less bodily and cognitively able to access those institutions, avenues of social mobility, and so on. 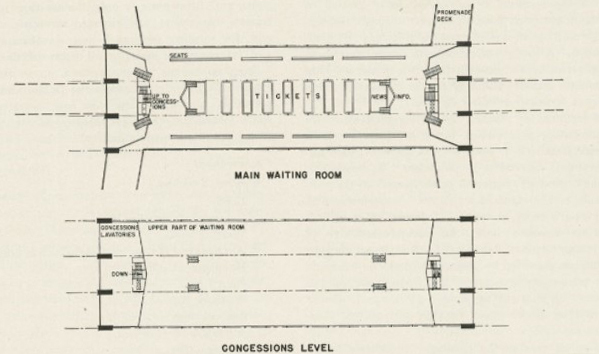 Diagram from Airport Planning by Charles Froesch and Walther Prokosch, 1946. Courtesy of the Prelinger Library. Airports and museums serve as important examples for de los Reyes, who says that people are often temporarily disabled in these spaces. Airports are designed for cognitive difference, with visual imagery and clear wayfinding to address and enable those who can’t read a given sign or experience communication barriers. They are also exceptionally physically accessible in their attention to the movement of passengers carrying luggage and wheeling suitcases behind them. De los Reyes describes standard museum layout as an analogous mode of inclusive design: patterns and a common tread guide you through the space, whether or not you’re aware of the cultural narratives behind an exhibition. In this way, inclusive design has always been a part of curatorial practice. Willem Sandberg, Schematic ﬂoor plan of new museum wing, 1954. From Carel Blotkamp et al. (eds. ), Museum in Motion: The modern art museum at issue, 1979. I am a regular volunteer with the Access Program at the Fine Arts Museums of San Francisco. On Access Days, I have learned that dominant cultural narratives, the kind reified in old-school exhibitions of historical Western European art, can be subverted as much by the presence of people who would have been absent when these works were first hung in salons — visitors who require different designs to enter gallery spaces and inspire different interactions with the art’s gatekeepers — as by the most critical art historians and activists. The Beam tours have renewed for me the importance of fostering that moment when a visitor decides to linger in front of one work. The experience of following a Beam around the gallery as someone else chooses, perhaps for the first time, where she will go and how long she will stay there, is a lesson in sovereignty. Thanks to Karen Berniker, August de los Reyes, Johanna Hedva, Sarah Hurt, Nicole Lavelle, Christa Kliver, Kavita Krishnaswamy, Charlie Macquarie, Megan Prelinger, Rick Prelinger, and Bo Preising. As of June 2018, the following institutions in the United States use the Beam for public access tours: The Mob Museum, Living Computers: Museum & Labs, The Computer History Museum, Shedd Aquarium, Fine Arts Museums of San Francisco (the de Young Museum), Figge Museum of Art, San Diego Air & Space Museum, the American Museum of Natural History, and the Arsht Center for Performing Arts. hey this is perfect. I’ve done a similar access intervention using Music – to enable a DJ with Locked-in-Syndrome to perform his music in Europe – as he can’t travel.